I haven't really gotten to write anything about the game yet, because I started when it first came out and then had my final school term get in the way. Now I'm back to playing and I've made it around chapter 28 or 29. It truly is amazing. Playing on 1999 mode right from the start may have been a mistake, but I'm slogging through it and it's still highly enjoyable despite the frustrating difficulty. 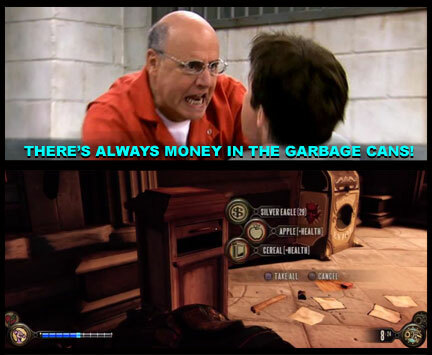 Well, I made this meme because, really, a majority of my in game money is from the trash bins. Apparently EVERYONE on Columbia throws all their money in the garbage. Maybe there is some sort of infinite universal bank system that uses them as depositories or something? It appears that it would be highly lucrative to be a waste management professional/garbage man on Columbia.